Before you go, here are six things to know. The Coryell County Commissioners are expected to discuss a lawsuit that was filed by the family of Kelli Page, an inmate who died January in custody at the Coryell County Jail, against two jailers after an autopsy determined she was suffocated while being restrained. The meeting will begin at 9 a.m. Monday in Gatesville. You can follow our coverage here. Harker Heights police is asking for the public's help to find a suspect who passed a stolen check through the USAA ATM on Indian Trail Dr. on Feb. 2. Here's what he looks like, and the phone number to the Harker Heights Criminal Investigation Division. Daryl Kieth Peters will officially be sworn in as the new Justice of the Peace for Precinct 4, Place 1, on Monday. Bell County Commissioners unanimously selected Peters to replace Claudia Brown, who was removed from the bench in February, in part, for setting a $4 billion bond in 2017. The Baylor Lady Bears will face No.8 Cal in the second round for the first time since 2014. Before tip off at 8 p.m. Monday, brief yourself on their last game. Coverage of the ITC Deer Park fire continues in its second week. Here's the latest from the tank farm. 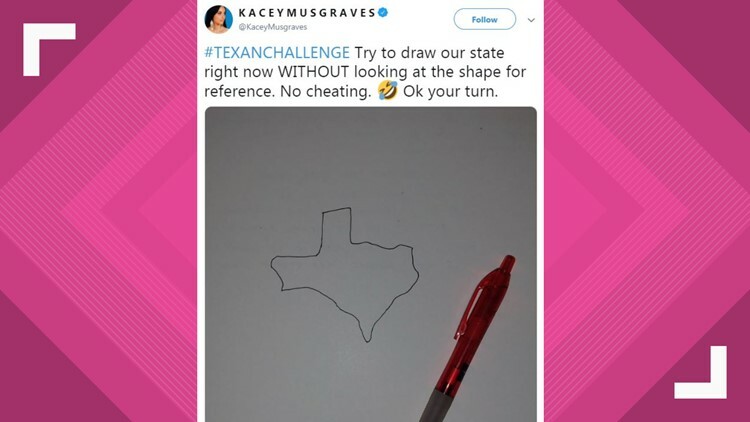 Kasey Musgraves, Texas native and Grammy award-winning country music artist, took to Twitter to challenge her fans to draw Texas by free-hand. Kasey Musgraves, a Texas native and Grammy award-winning country artist is challenging her fans to draw the Lone Star State without looking at the shape for reference. "So, why don't you giddy up, giddy up" and give it a try yourself! Thank you for tuning in to Texas Today!